The Zulu War of 1879 was the most controversial and brutal British imperial conflict of the nineteenth century. Launched as a pre-emptive strike against the Zulu kingdom of King Cetshwayo – who had no quarrel with the British Empire – the war was supposed to turn a host of disparate colonies into a South African federation….. Superb, brilliant, magisterial… must now be regarded as the definitive history of the Zulu War. In scholarship, professionalism and insights it towers above Morris. David produces here a splendid, judicious, massively researched, highly coloured yet subtle combination of narrative and analysis. 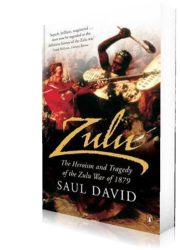 One of the many delights of David’s marvelous book is the way it enables one to gauge the historical accuracy of the movie Zulu. Must supersede Donald Morris’s bestseller The Washing of the Spears. A squalid story, told by a historian with an advocate’s eye for the damning detail. More concerned with dispelling myths than flag-waving. David is brilliant at showing both sides of the combat and the book includes magnificent accounts of the shambles that was Isandlwana and the feat at arms that followed it at Rourke’s Drift.